Image: Roberto Molar-Candanosa, Carnegie Institute for Science. Researchers say they have found 12 new moons orbiting the planet. In total, Jupiter now has 79 moons, more than any other planet in the solar system, according to the Carnegie Institution for Science. The moons were first spotted last year while researchers were focusing on objects in the distant solar system in the search for a possible massive planet beyond Pluto. Nine of the newly discovered moons orbit the planet in the opposite -- or retrograde -- direction of Jupiter’s spin rotation. It takes these moons about two years to orbit Jupiter. Scientists believe that they were part of what is “thought to be the remnants of three once-larger parent bodies that broke apart during collisions with asteroids, comets or other moons,” according to Carnegie. 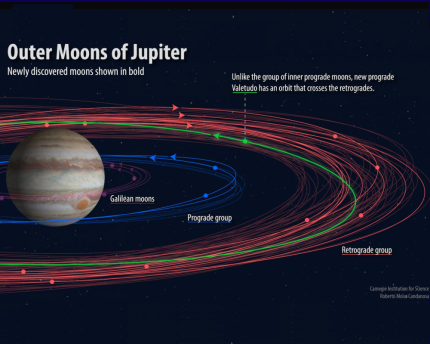 Two of the other newly spotted moons are closer to Jupiter and orbit in the same (prograde) direction as the planet. These moons take less than a year to orbit and could be fragments of a larger moon. Scientists refer to the final moon as the “oddball.” It is less than 1 kilometer in diameter -- a little more than a half-mile -- and is possibly Jupiter’s smallest moon. It takes one and a half years to orbit Jupiter, and while its orbit is prograde, it crosses the outer retrograde moons, the institute explains. Researchers propose the name Valetudo for the oddball moon. The name is taken from the Roman god Jupiter’s great-granddaughter, the goddess of health and hygiene.